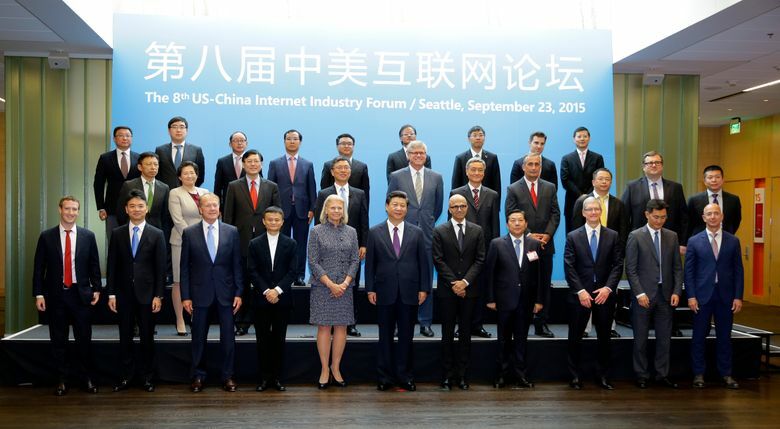 Remarks by Xi Jinping on Internet and technology policy capped off a daylong Internet-industry forum held at Microsoft. Chinese President Xi Jinping told a group of U.S. and Chinese technology executives Wednesday that the country would give priority to a secure Internet, and defended the rights of countries to impose their own regulations on domestic Internet development. “A secure, stable and prosperous cyberspace is of great significance” to the world, Xi said after posing for a photo with dozens of executives at the conclusion of the annual U.S.-China Internet Industry Forum held at the Microsoft campus in Redmond. The U.S. and China must work toward that goal together, he said. Xi’s remarks came after the forum, which earlier in the day brought together business and government leaders from both countries and displayed the split between U.S. and Chinese interests. U.S. government and trade group officials emphasized, politely, their view of the necessity of a free and open Internet, and highlighted worries that new Chinese regulations will put U.S. companies operating in the country at a disadvantage. Their Chinese peers, including the country’s chief Internet regulator, emphasized cooperation and understanding, sharing the common refrain of Chinese leaders that the country’s distinct history and level of economic development means the U.S. shouldn’t expect it to adopt the same policies toward the Web. China has been widely criticized in the West for censorship of news, blocking of social-networking sites such as Facebook and other restrictions. 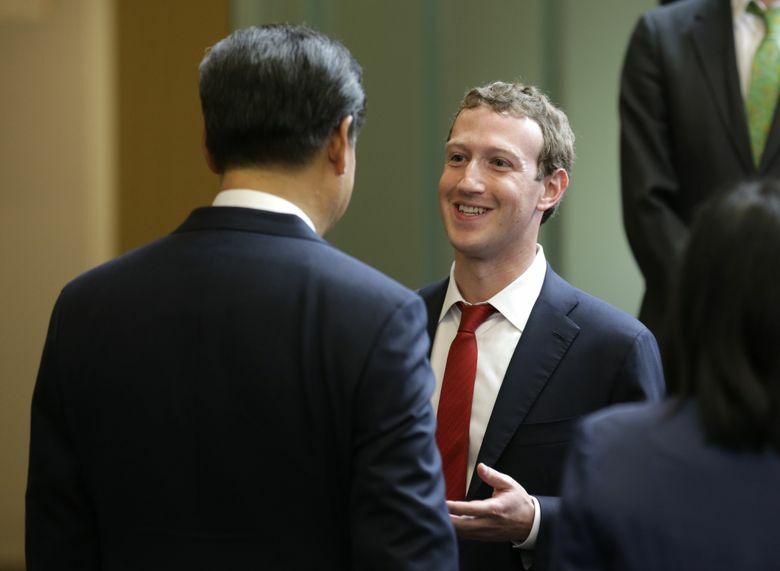 During Xi’s visit to Microsoft after the forum, Facebook Chief Executive Mark Zuckerberg appeared to speak to Xi in Mandarin just before a group photo. Xi was greeted at Microsoft’s Redmond campus by officials including co-founder Bill Gates, Chief Executive Satya Nadella, Chairman John Thompson and President Brad Smith. Xi and Chinese Internet czar Lu Wei posed for a photo with about 30 U.S. and Chinese technology executives, including Apple CEO Tim Cook and Amazon.com’s Jeff Bezos. Other executives represented IBM, Cisco, Intel, Lenovo, LinkedIn and Qualcomm. After his remarks, Xi left for a tour of Microsoft’s executive-briefing center, including a demonstration of Microsoft’s in-development HoloLens holographic headset. In the session at the beginning of the forum, Lu, who is the chief of China’s Internet policy, echoed the comments Xi made in a speechTuesday night, pledging China’s cooperation on cybersecurity and emphasizing the necessity of cooperation between the two countries. Despite the occasionally upbeat commentary aired Wednesday, there’s significant tension between U.S. and Chinese business and government interests. U.S. technology companies are eager to tap the potentially lucrative consumer market of the world’s most populous country, but are wary of industrial espionage and government restrictions on their ability to operate in the country. The Chinese, meanwhile, raise concerns about U.S. government surveillance and national-security concerns that tend to crop up when Chinese companies make deals with U.S. competitors. That hits home for Microsoft, which has seen its sales in China hampered by widespread software piracy. Meanwhile, Chinese regulators last year were said to open an antitrust investigation of the company, and some Chinese government agencies were said to discourage use of products made by Microsoft and other U.S. technology companies. Reporters were invited to about an hour of speeches that kicked off the forum, after which the proceedings went behind closed doors. Lu bracketed his comments with a lengthy ancient Chinese parable about two people on a boat in stormy weather who must work together to take in sail and reach the shore. “We are on the same boat,” he said. “And nobody should even think about pushing one of us off,” he added, to laughter. While Chinese President Xi Jinping’s activities grabbed most of the limelight Wednesday, a few other developments highlighting the ties between the U.S. and China were announced. • Industrial and Commercial Bank of China (ICBC), the world’s largest bank by total assets, is opening its first office in the Pacific Northwest in Seattle, according to the Economic Development Council of Seattle & King County. The Seattle office is the first expansion of ICBC’s network after its acquisition of the former Bank of East Asia (USA), according to the council. ICBC has a presence in 40 countries and regions, according to the council. Its first U.S. branch was establish in New York City in 2008. • Washington state and Sichuan province in southwest China have signed an agreement to push for technologies and investments that prioritize clean energy and plans designed to develop low-carbon cities. The agreement, also signed by the University of Washington and Tsinghua University in Beijing, pairs experts from the UW’s Clean Energy Institute, Climate Impacts Group and other groups, with their counterparts at Tsinghua University, according to a news release from the UW. The UW and Tsinghua University had earlier this year announced a partnership to create the Global Innovation Exchange, a graduate institution in Bellevue. • Microsoft unveiled a slate of agreements, including a deal that will make China’s largest search engine the default home page for Microsoft’s new Edge browser in the country. Baidu will be both the home page and default search engine for Microsoft Edge, the browser the Redmond company introduced with its new Windows 10 operating system. In exchange, Baidu will offer a tool to help Chinese consumers download and install Windows 10.